As promised I used up the rest of my red and black spandex mix fabric by sewing another Kwik Sew 2948 twin set. I only had enough of the black and red fabric to make the vest from the twin set and just enough to cut the front band of the cardigan creating a nice contrast. I scooped out the neck again for the vest bringing it lower than the original pattern, which I think looks a little nicer, especially if the fabric is busy and here is the result of my efforts. I don't have a photographer available to show me wearing this, but I have tried it on and it fits great. I have been using my shoulder pressing tool to press the sleeve caps of the tops I have been making, and boy it is so much easier, and is stable enough to hold the whole cardigan leaving both hands free for moving the garment and pressing. Here are all the garments shown together, creating a sort of mini wardrobe from the 5 pieces and a pair of jeans. These will work well with black work pants or a black skirt and heels (next on my list). I can wear the plain black cardigan with the red and black vest, or the long-sleeved top, etc etc. I think to build on this mini wardrobe I need to make myself a black skirt soon to go with all the pieces. That's me done with my sewing for the weekend. I hope you have all had a productive weekend. I love the red and black print! Yes! This is a great mini-wardrobe you´ve created. I love that fabric! Love what you made from the black and red fabric. I've sewn my blach and white fabric as a dress this weekend/week. Hemmed it tonight and will wear it tomorrow. Such great fabric. look forward to seeing your black and white fabric made up. A lovely mini wardrobe and, yes, a black skirt will be perfect. I wonder if you could find a red that matches perfectly and make another top to wear with these to extend the wardrobe just a bit. 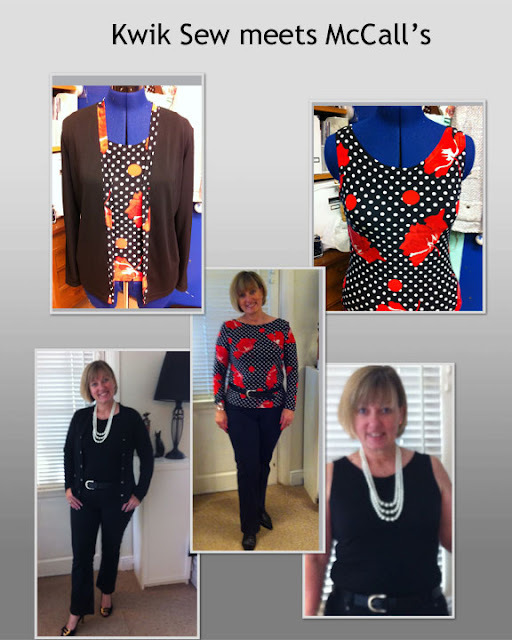 New twinset fits perfectly into your wardrobe - well done!!! I really love the contrasting band with the matching top beneath! This is beautiful! What a great mini wardrobe. Your pieces all look great together. How I envy you that sleeve press. I want one of those! 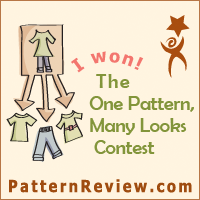 Great mini wardrobe--you look wonderful! Can you tell us a little about your sleeve pressing ham? I have not been able to find one like it on a stand. It looks like a perfect tool. Thanks! Hi Denise - the details for the pressing ham stand is on the right-hand of my blog - I posted these up because I know we haven't been able to source these anywhere before. He does ship outside the UK (not sure where you are). There are three types - one just holds the ham that you may already have. 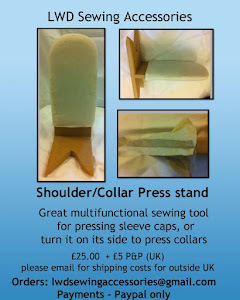 The other is a padded wooden stand which gives more height, and the third is a combination of collar press and the sleeve pressing ham in one tool so great value for money as I paid £28 + pp for my collar pressing tool alone. 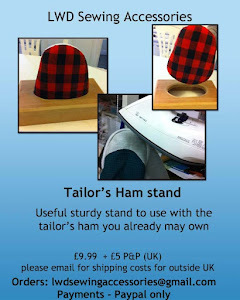 The ham stand doesn't include the red ham you see in the pictures. Suggest you drop him an email lewiswdavis@hotmail.co.uk if you are outside the UK for shipping costs. Thanks so much for the information. I am in the US, so I will email him for specifics. Such a great idea! Okay, that does it! I must have this pattern. Your sweaters are absolutely adorable!! 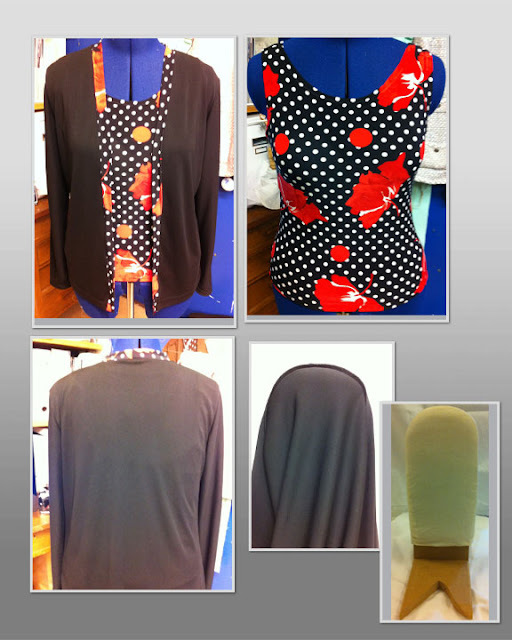 Great idea adding the dotty floral fabric to the cardigan. It looks wonderful with the tank top. What a sophisticated looking wardrobe, and fun too because of the pretty red and dots.